With the Autumn already in full flow it’s the right time of year for making any home improvements before the Christmas rush! So what is DIY? It's simply an abbreviation of ‘Do It Yourself’ and can in its simplest form be hanging a picture and at its more advanced level encompass more specialist skills such as carpentry. 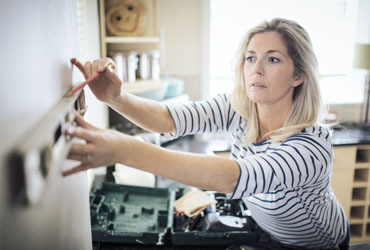 Having said this, if you are a novice it is best to start small and build on your skills, so before proceeding with a large DIY project like building your own fitted kitchen, perhaps instead consider changing the kitchen cabinet doors and replacing the cupboard handles to update your kitchen instead. In order to carry out works on your own home you will first need a few basic tools. Possibly the most commonly used tools are a hammer, multi-head screwdriver, metal tape measure, spirit level, pipe and wire detector, electric drill, paint brushes, roller, wood saw and pliers. Don’t forget small essentials like screws, picture hooks, dust sheets and masking tape too! Of course, the exact tools you will need depends on what you are trying to achieve, so make sure that you have the necessary tools to hand before commencing work. Once you have your tools and essentials you are ready to get started with your first DIY project! Need some tips first? Why not check out our previous blogs 8 Tips on Painting Like a Professional and how to Repair Door Handles.